Does support for Welsh Independence stand at 67%? 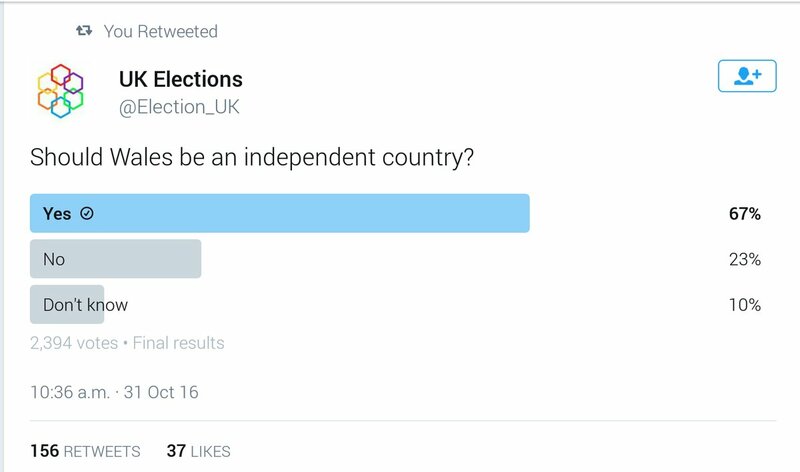 According to a recent Twitter Poll by the respected UK Elections account, 67% support independence for Wales. Now it’s entirely correct to point to the obvious flaws of this poll. It’s online, people can vote multiple times, it’s accessible across the globe. All of these are true. Some individuals will indeed have opened several browsers in order to vote several times – both in favour and against the question. Some individuals across the globe will have also participated, but it’s probably fair to say that the vast majority of the respondents will be UK Citizens, and I’d hazard a guess that, if the response in England to Scottish Independence is anything to go by, I’d imagine that most of those from outside Wales would oppose the idea of Welsh independence. It’s also worth noting that with all of its flaws, Twitter polls can also guide public opinion. the ONS Twitter channel is a great avenue for gauging public opinion about our statistics from users of our statistics and people who are engaged with us as an organisation. But what’s more interesting is that it follows a pattern. So far a whopping 77% agree that, in the event of Scotland leaving the UK, there should be a referendum on Wales’ future (this poll is still open). According to a YouGov/ITV Wales/Wales Governance Centre poll held in July 2016 a little under 25% of the Welsh population support independence for Wales if Scotland went independent, and up to 35% favour independence if it meant Wales staying within the EU. Compare this to Scottish polling prior to 2014, before their referendum campaign properly kicked in, which showed support for Scottish Independence at between 25% and 30% (sometimes a little higher, sometimes a little lower). In nine short months the Yes! campaign in Scotland increased this to 45% in September 2014, while No remained stagnant. The ‘Undecideds’ went Yes! So what about our prospects in Wales? Polling – both official and unofficial – indicates that support for independence is increasing. As it becomes part of our national and political narrative, with people discussing it’s merits and potential, then it becomes more and more appealing. So what if a referendum was held in Wales following Scottish Independence? I don’t know about you, but I fancy our chances!